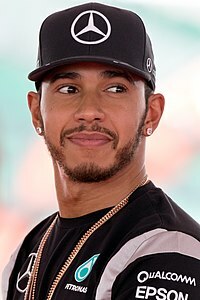 Lewis Hamilton holds the record for the most career pole positions with 84. Formula One, abbreviated to F1, is the highest class of open-wheeled auto racing defined by the Fédération Internationale de l'Automobile (FIA), motorsport's world governing body. The "formula" in the name refers to a set of rules to which all participants and cars must conform. The F1 World Championship season consists of a series of races, known as Grands Prix, held usually on purpose-built circuits, and in a few cases on closed city streets. The polesitter is the driver that has qualified for a Grand Prix in pole position, at the front of the starting grid. Drivers are awarded points based on their position at the end of each race, and the driver who accumulates the most points over each calendar year is crowned that year's World Champion. Out of 1,000 completed Grands Prix (as of the 2019 Chinese Grand Prix), the driver that has qualified on pole position has gone on to win the race 417 times. Qualifying is traditionally contested on the Saturday of a Grand Prix weekend to determine the drivers' positions on the starting grid. Historically, there have been a number of different qualifying systems; previously, each driver was only allowed a single lap to set his qualifying time. Drivers currently have to compete in three rounds before pole position is determined. The first round known as Q1 is contested by twenty drivers in an 18-minute session, at the end of which the five slowest cars are eliminated. This is followed by Q2, a 15-minute session, where the slowest five are again eliminated. The remaining ten cars contest Q3, the final 12-minute session to determine their places on the grid and who will sit on pole-position. Lewis Hamilton holds the record for the most pole positions, having qualified first on 84 occasions. Michael Schumacher is second with 68 pole positions. Ayrton Senna is third with 65 poles. 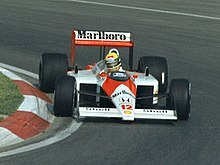 Senna holds the record for the most consecutive poles; he qualified in first place eight Grands Prix in a row from the 1988 Spanish Grand Prix to the 1989 United States Grand Prix. Sebastian Vettel is the youngest polesitter, he was 21 years, 72 days old when he qualified in first place for the 2008 Italian Grand Prix. 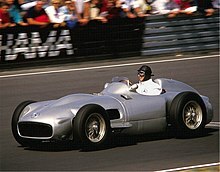 The oldest person to qualify in pole position was Nino Farina, who was 47 years, 79 days old when he was polesitter for the 1954 Argentine Grand Prix. As of the 2019 Chinese Grand Prix, 99 drivers have been on pole position in the 1000 Grands Prix since the first World Championship race, the 1950 British Grand Prix. From 2014 onwards the driver who achieves the most pole positions in a season is awarded the Pole Trophy. The inaugural Pole Trophy was won by Nico Rosberg; the 2015, 2016, 2017 and 2018 trophies were won by Lewis Hamilton. Lewis Hamilton is a five-time world champion and holds the record for most pole positions, and for the most wins from pole. Michael Schumacher has won the World Drivers' Championship a record seven times – twice with Benetton and five times with Ferrari. Sebastian Vettel achieved 44 of his pole position tally with Red Bull Racing, for whom he also won four consecutive titles. Diepraam, Mattijs (27 May 2012). "Pole positions in World Championship events". Forix. Autosport. Retrieved 6 June 2012. ^ "WIns by grid position". StatsF1. Retrieved 9 April 2018. ^ "2003 Formula One Sporting Regulations" (PDF). Fédération Internationale de l'Automobile (FIA). 19 March 2003. p. 12. Retrieved 2 September 2010. ^ "Practice and qualifying". Formula One. Retrieved 2 September 2010. ^ Lynch, Steven (22 June 2012). "The winning formula". ESPN. Retrieved 7 July 2012. ^ Benson, Andrew (13 September 2008). "Vettel on pole at rain-hit Monza". BBC Sport. British Broadcasting Corporation. Retrieved 2 September 2010. ^ Lynch, Steven (29 March 2013). "Team treachery – Ask Steven". ESPN. Retrieved 2 August 2015. ^ "British GP is secure: Ecclestone". BBC Sport. British Broadcasting Corporation. 20 June 2009. Retrieved 12 January 2010.